Any who might be moved to contribute to the Montepulciano Easter Festival can do so by bank transfer to the account of the Social Promotion Association we founded on 22 June 2015, specifying in the motive section "Contribution to the Easter Festival". 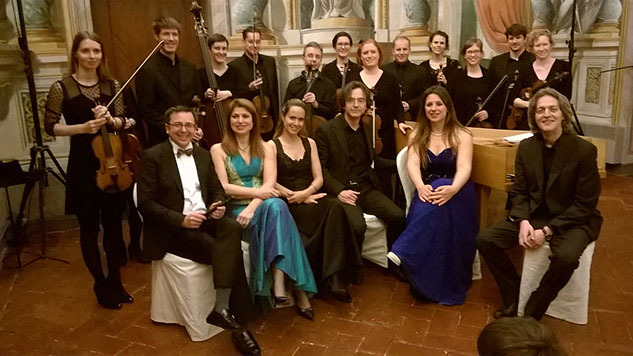 At the beginning of February 2015, and with little over 2 months to go until Easter, we decided to throw ourselves into the enthralling if exhausting process of giving birth to a music festival in Montepulciano during the Pascal period. The mere idea of creating out of nothing a Festival in that short a space of time must have been generally received as lunacy. It is undeniable that sanity would have dictated the necessity of a launch in 2016, so as to have time to ponder all the details and above all to raise the money for such an undertaking. The fact remained, however, that just as the idea of creating a Festival was more a matter of the heart than of judicious reasoning, to follow a dialectic dear to the 18th century aesthetic, such was the case also when it came to breathing life into the idea. After various (vain) attempts to behave more "reasonably" we came to see that we preferred to plunge headlong into the adventure, even at that late hour, and even without having, and furthermore with no prospect of having, any funding, either private or public. And so we set to work, programming six concerts over six days, which were attended with enthusiasm by a considerable number of people despite having had so little lead time - in this world of ours of mass and timely communications our website was launched a mere 23 days before the opening concert - and despite the cold and wet weather during the Festival. We could not have managed without the generous efforts of a number of people who shared our enthusiasm whole-heartedly - the musicians first and foremost, but also collaborators, the website team, translators - and also thanks to the enlightened support of some infrastructures in the area which offered their venues, instruments and staff. Everyone offered their services for the pleasure of participating in a collaborative experience which we hope was, in the spirit of Beauty, reward enough itself. However, even although volunteered help was from the start available to our small, new-born effort, inevitably costs mounted up, to the tune of several thousand euros. We elected to underwrite these costs personally, because we consider them an investment in a project in which we strongly believe, convinced also that we stand to gain from everything that has or will come to life. Nonetheless already during our first year of life, last year, with simplicity and humility we asked for a contribution, however small, from those who came to our concerts. And we have received our first responses, which we consider of the greatest importance and for which we are profoundly grateful! Now, with more than one Festival behind us and embarking on another, we are seeking again to appeal to you from the heart for your help. The dramatic situation in which this country finds itself, above all in the cultural field, has meant that almost all our efforts to raise funds, whether private or public, for our Festival have come to next to nothing and so, like last year, we come, hat in hand, to ask for your support and that of others. First and foremost you can support us by attending the concerts; it is our audience which rewards our efforts and those of the musicians and which, by paying the entrance fee for the concerts, makes a contribution towards the organizational and logistical costs. But, you can also help by making a donation, however small. This appeal goes to all our friends and supporters, but also to people we don’t yet know but who might have been touched by reading our website and being inspired both by our enthusiasm and by the project and its ideals. On the occasion of the concerts themselves we will also hope to spread the word amongst our public, which we hope will continue to expand. The existence of a large number of people who, despite everything, are committed to the idea of Beauty, would already be for us a source of joy and profound satisfaction.